NOTE: another “passed from the blast” — appears to have been conjecturated ~ Later Nov., 2010. One could (or even two, or more) look at all activities as palliation, of sorts. The first big freeze of the season came early. Ran in it. Continue to run in it, besides residual leaf-raking and the Sisyphusian shoveling and re-location of horsie and doggie poo-poo. And other re-distributions. Create? Destroy? Physics elucidates that matter/energy cannot be “destroyed” nor can anything be “created” — just transformed. Or moved to another location. That’s basically all I do, and not very well at that. Sigh. Tell that to my aching back! An acquaintance, a local weather-scientist, tells me that six years ago was much colder, and, yes, it was. Still, it’s cold now, mostly due to everybody having been somewhat spoiled until mid-November. 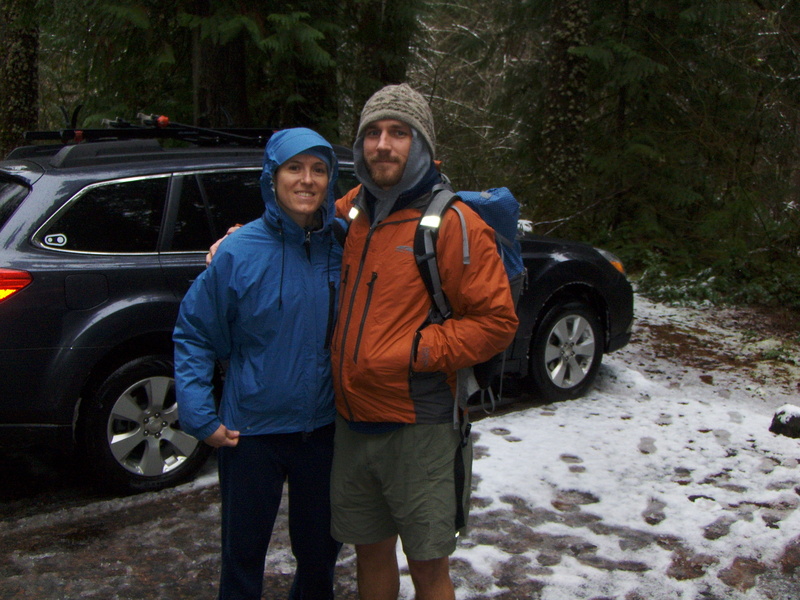 Ben and Raytsch took, pulled, left me on a slorshy foggy forest path along the upper Clackamas. (I KNOW I would have been much much more apprehensive and attentive to my parents under such circumstances!) In spite of frequent reminders of the movie “Romancing the Stone” where our hero(in)es slip-and-fall down a hill thru’ the sheet-flood-rainy hillsides almost to the river below, fortunately I did not slide thru’ the sharp rocks and broken ends of stumps and branches into the 33-degree rushing Clackamas. 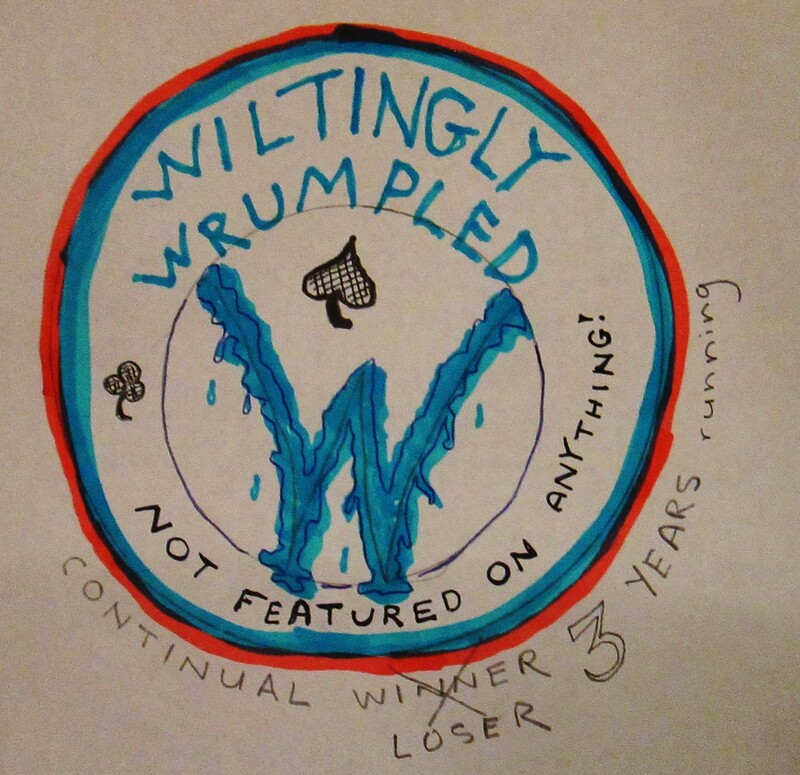 It was highly possible, verging on probable, however. A good scary adventure and workout. 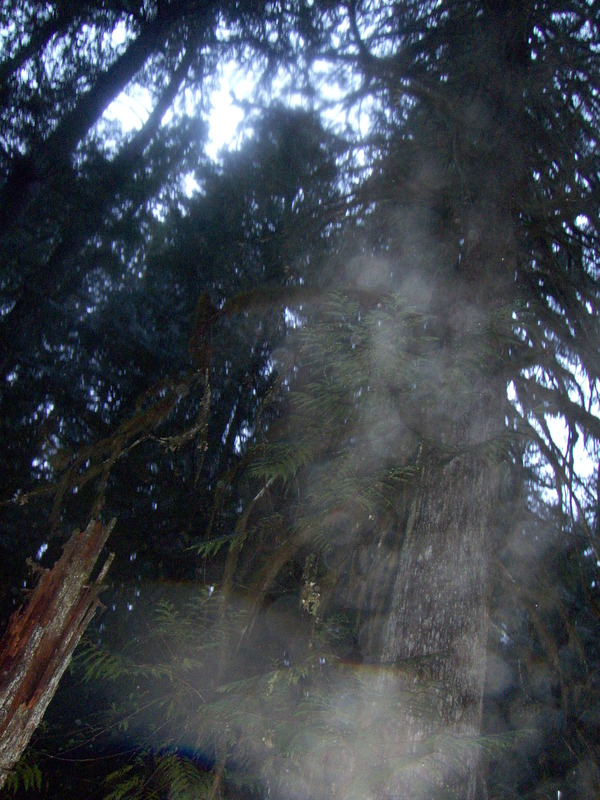 Followed by a verging-on-extradimensional soak in a large hot-tub adjoining a wilderness area further up in the mountains. Snow was falling. The adjustable inlet into the hot tub was (by my calibrated and practiced calculation) 112° F. The joy of the adjacency of the immanency of death-by-frostbite and so-hot-your-corpse-will actually cook. We luxuriated for an hour. If one looks at the intersections of any group of people’s favorite relaxing past-times, and the more-active group’s favorite group outdoor activity, and that outcast not-so-normal collection (such people are in such short supply that they rarely are a “group” but perhaps a thin … collection) of humans’ preferred indulgence, then the group-soak in a high-mountain hot springs bears few challengers. I don’t know about the Oregon residents, but for the refugees from the arid high-desert climes, this was an extra-worldly immersion. Fortunately, the air temperatures were such that after having exited the sauna-world, we walked and exerting any effort beyond the zomboid-corporeal, we’d stay warm. But we kind of had to hurry, no tarrying. And the following run … two days later. I had never been to Forest Park, world-renowned if one lives in Portland and adjoining areas — “the largest city park in the world.” Rumors circulate that there are tree-house villages more than a generation of longevity, of almost self-sufficient communities, some of whom venture out of the woods once every two weeks — to pick up general-delivery mail (tap into the wireless network), buy supplies, shower? doctor visits, cappuccinos and other dietary esoterica, and disappear back into the forest. So we ran there. We met Wade, whom none of us had seen for months and months as he had just returned from New Zealand at a sort of pass or high point in the Park. Ben’s brother and his wife, who had journeyed down from northern Warschington to join all of us for an early Thanksgiving, were part of the crewe. Ben’s sister-in-law and Betty were to walk the dogs while the rest of us ran. Wade was not comfortable with the pace the others trotted off at, so I followed him. We ran, occasionally talking for about two miles. We encountered a dozen or two other runners, all running the opposite direction. I wondered if the Park had an unofficial rule that everyone runs the trail one direction one day, and the other direction the next. If so, we were swimming upstream. We spent the actual Thanksgiving with Tom at his house. We drove over the night before on ice-and-snow-packed roads, watching the outside temp (as indicated by the car’s thermometer) creep down, and down … to about seventeen below when we reached our destination. Tom’s mental health appears to be above average. Hockey helps. I think hockey would “help” me, too. (Darn). Still, while so-called awake, I also frequently marvel. At the interplay of the first light of the day on distant hillsides, the underside of clouds — as if one could pluck the edge of a very large fabric and the whole thing would ripple, and of such things as horses racing across a field or the baby desert bighorn sheep gamboling about on the clifftops or something as seemingly mundane and ordinary as the ever-present crows sitting atop power poles keeping watch on us. I know the BBITS* has aspirations, or, if not exactly aspirations, a probably unrealistic perfect-world-scenario expectation of us to GET SOMETHING DONE in this life. Sigh, it could be the life after next for me. At this rate. Yawn. Dizzyingly, can’t stand up, won’t speak up, retreat to the back of the room, the dream fades, continued entropy. *big-bulbous-in-the-sky. Do you call it jesus? allah? the moronic angel atop the steak center? The noon-time siren going off at the courthouses of small towns all over amerika? and canada too? making the dogs howl. small wonder. we should all howl too. if only we knew. the thin lying betwixt being swept along with time, and being able to FORD THE STREAM and, finally, dripping wet, but alive, looking around, taking stock of the possibilities, you are on THE OTHER SIGHED. Betty & I were going, as has become habit, to visit our kids for Thanksgiving. Rachel and Ben live in Portland (OR), and we don’t. 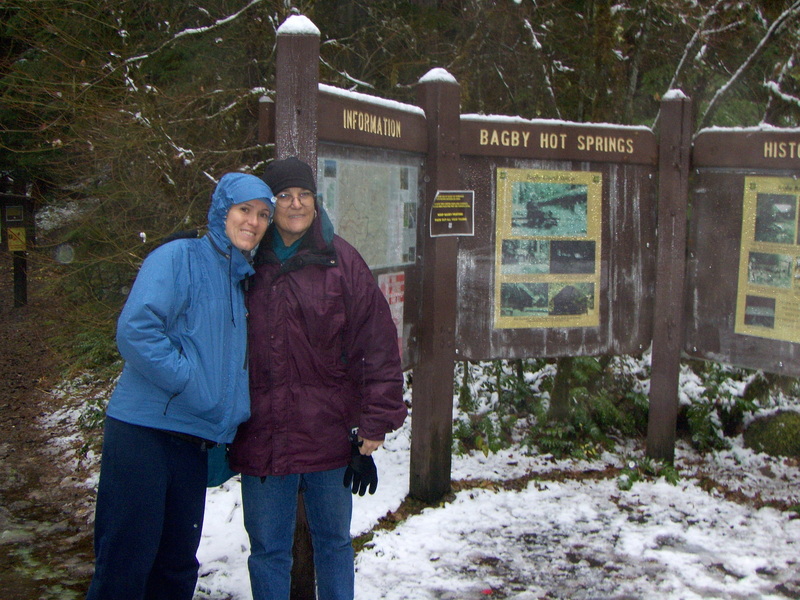 “The kids” were going to be busy at work for a few days early in our arrival, so Betty looked for “things to do.” She googled “hot springs” in Oregon, and something named Bagby was tops on the list. We perused the information — it sounded nice — seemed too far away — heck, we were just looking. We flew in, rented a car, and the main trip “on our own” was to go see Astoria. ‘Twas fun. Kids ended their work shifts and suggested we go into the mountains, southeast, up the Clackamas, and take in Bagby Hot Springs. Another in the never-ending series of what you might call ‘coincidences’ in our lives. 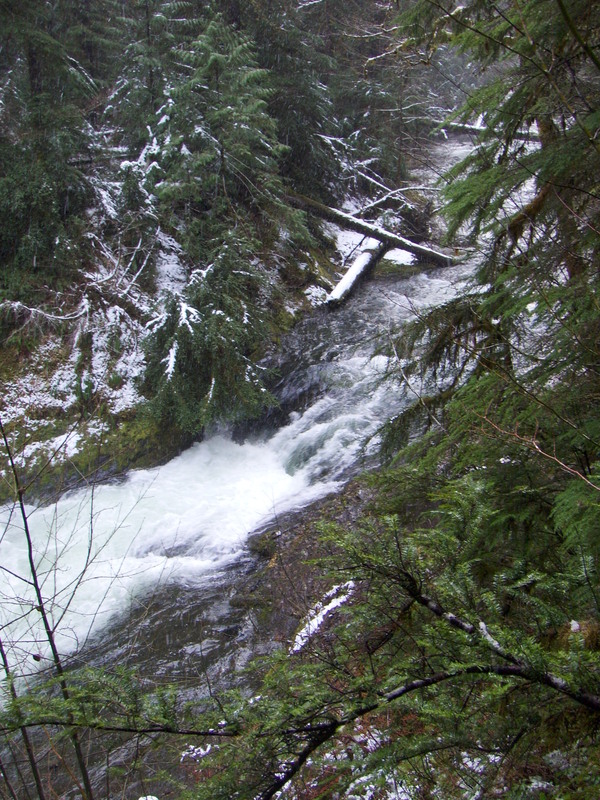 We had been to the Clackamas above Estacada the previous spring. A resplendent sunny day, and Ben visited a certain area occasionally to acquire a truckload of smooth river rocks for his never-ending yard-beautification projects. We went on a run on a trail on the hillside above the river, Ben and I, while Betty negotiated what she could on a mountain bike. The next day, my back had seized-up and was somewhat inoperative — probably due to improper heavy-rock-lifting techniques. 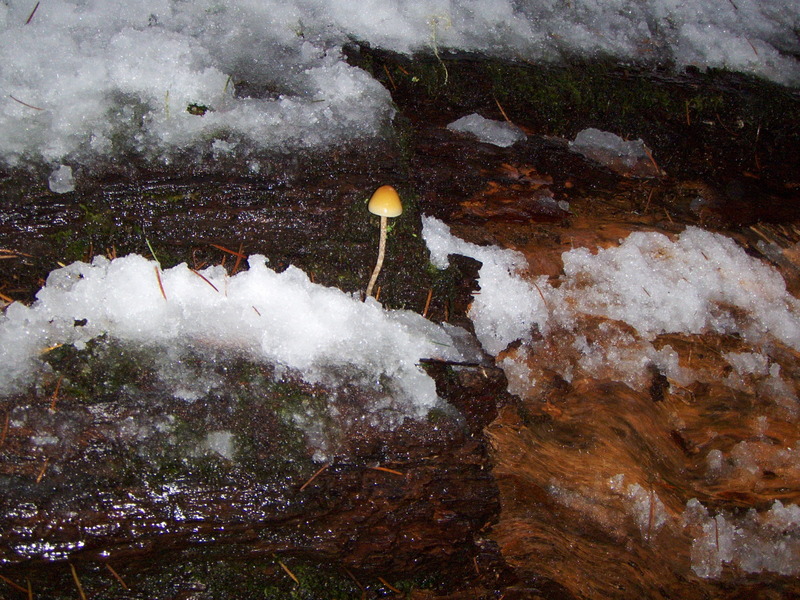 Mid-November 2010 — the first winter storm for the Oregon mountains was imminent. 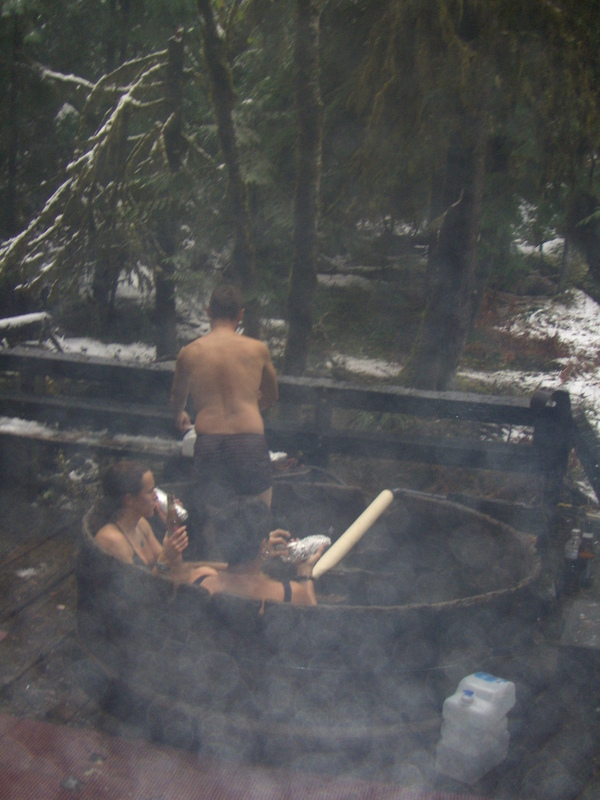 The idea of a hot springs soak was even more alluring. Ben & R planned the trip with a lot more detail than Betty and I would have. 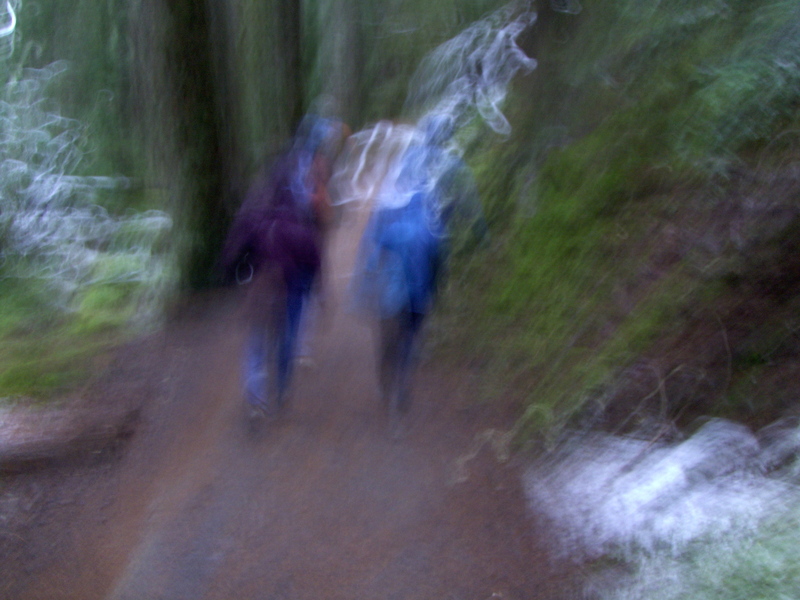 We had plenty of beer, they bought gourmet sub sandwiches at a deli in Estacada, and, of course, we had to go on a run. We stopped for provisions on the way, and then pulled over at a trailhead above where we had visited the previous spring. The predicted storm had begun, mostly slush and icy rain but the temperature was tolerable. We hardy mountain folk (yeah, right) were not worried. As soon as Ben and R trotted down the trail (Betty was walking the dog) I was in unfamiliar territory. Back home, I do not run off-pavement when it was wet, as we live in the slippery-shaley-gumbo-y high desert. This stuff was definitely … sloshy. Slightly slippery. The precipitation continued (and increased) gradually, but “the kids” were obviously not worried. They ran away from me, but I knew when they turned back we would re-encounter and getting lost was not among my concerns. I was worried that I would emulate the scene from “Romancing the Stone” where our hero and heroine slip off the road down the frictionless muddy hillside into the river. The river surged and roared scant yards below me. The water temperature was probably just a few degrees above freezing. Frequently the thought occurred to me that here was a “senior citizen” (over 60) left alone in the Oregon wild elements, with emphasis on elemental and wild, bare-legged, thin socks, totally soaked shoes. Would I have done that to my dad? In retrospect, they must have had more than a slight amount of faith in my abilities, more certainty than I. “The kids” turned around as planned. I saw them coming, reversed course, tried to stay ahead. After a few minutes I was alone again, sloshing through the ever-deepening puddles and taking it real easy when on the wood bridges, and, especially, on the trail sections closest to the river. Our trip plans, as stated before, surpassed most of what I would have considered, but we did not have much in the way of dry clothes. 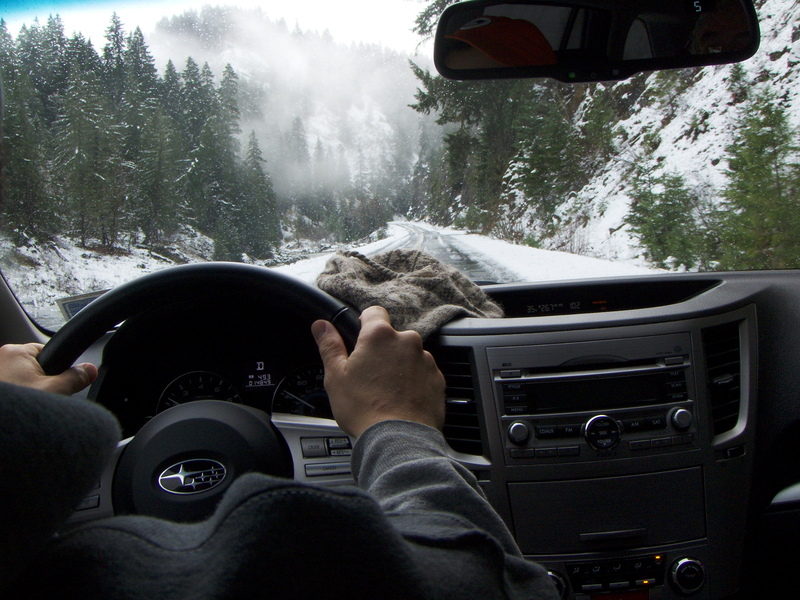 We huddled into the car and Ben piloted the craft up, up, and into the increasing snowstorm. We hadn’t seen any other vehicles for quite some time. There was a van pulled off the road not too far into our drive, and two guys were getting ready to ride their bikes. 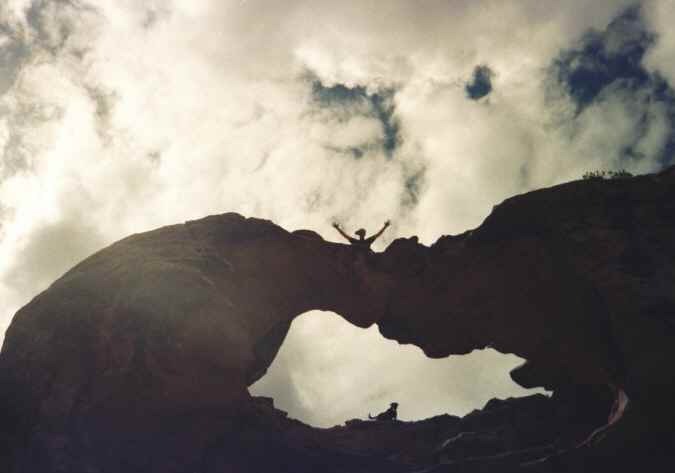 (Oregon might have as many extreme wilderness-adventure types as Colorado). We didn’t give this much thought. Ben and Raytch had been to the hot springs a couple times before, and knew the road. I’m pretty sure that previously it hadn’t been like this. The visible road-pavement area diminished, until there was barely evidence of just the tire-tracks of whatever vehicle had passed this way last. I think it was a car we saw going down. The snow, if you could call it that, deepened with distance and time, until the schlussh reached mid-hubcap. 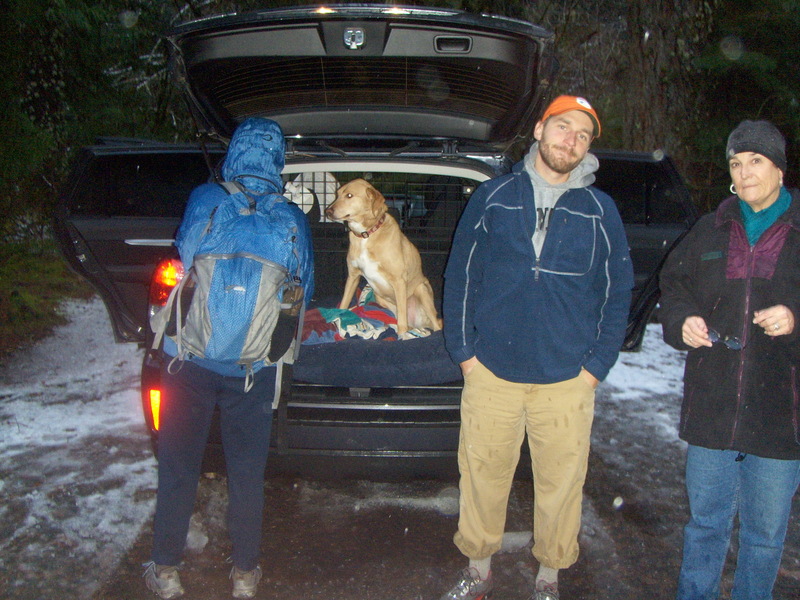 they’ve only run 4 miles thru the slush, NOW we’re ready to hike! We pulled off the road and into a parking lot. There were two other vehicles there, and I seem to remember that a group was leaving. My memory of some things was hazy, probably affected by the weather. Yeah, foggy. We started hiking. “The kids” (B & R are 30 — “kids” as far as we’re concerned) assured us that it was an easy 1.5 to 2 mile hike. And we left their (poor) dog in the car. Ordinarily, no dogs are allowed. 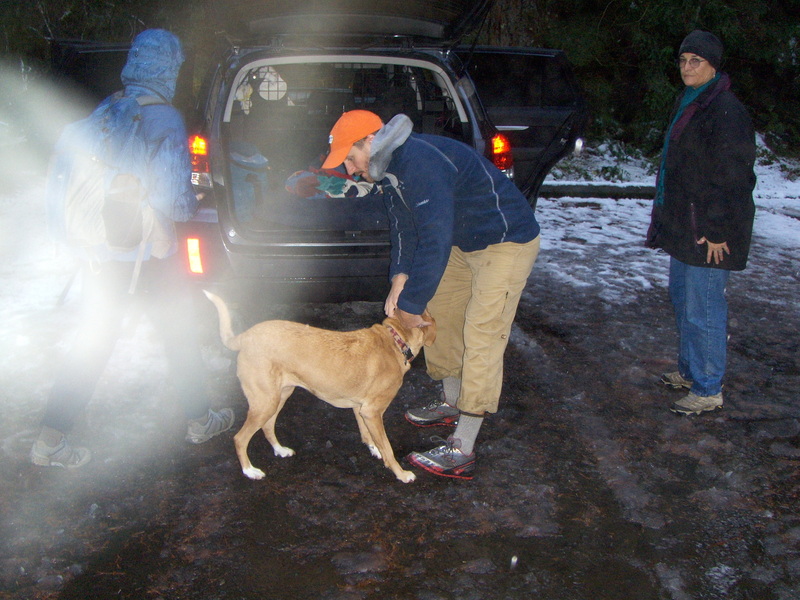 Had we known NOW what we KNEW LATER, the dog could have accompanied — no problemo. Worrisome entity as I’m occasionally apt to be, the potential-for-vexsome quotient was readily spread out on the table. We (we three runners) were already wearing our saturated running clothes, fortunately we had heavier jackets for outer-wear, but heck, back in Colorawdough, the temperature could drop many many degrees and, well, there might be a reason to worry. The Kids, after distributing the trek provisions somewhat equally, resolutely hit the trail without any trepiditatious indications whatsoever. Well, again, so soon, I was lost in foreign unfamiliar territory. I hadn’t been up an upper-elevation stream in Colorado while it was snowing in more years than I would like you to know. And then, we’d be on cross-country skiis and prepared for extended sub-freezing temperatures. The Kids lived in the area, and acted like what we were doing was, well, sort of normal. And so I lost myself into the primeval northwestern coastal foggy saturated late-autumnal forest. A sense of wonderment, like you might feel if you just totally abandoned textbook knowledge and plodded along with only instinctual gut-feelings as your guide. Made sense to me. If I considered the rational alternative, I’d hustle back quickly to the car, drive to the nearest town, and buy dry clothes. No, this was much more fun. Still, the 1.5 or 2 miles was taking a bit longer than, well, what I thought a 2-mile hike would take. We crossed a couple bridges, switch-backing high above the river. Coming down the trail was a happy jubilant boistrous group of people. “Heck,” I thought, “we might have a hot tub or pool all to ourselves, without sharing!” The Kids had mentioned, more than once, that usually you might have to sit in a tub with strangers. 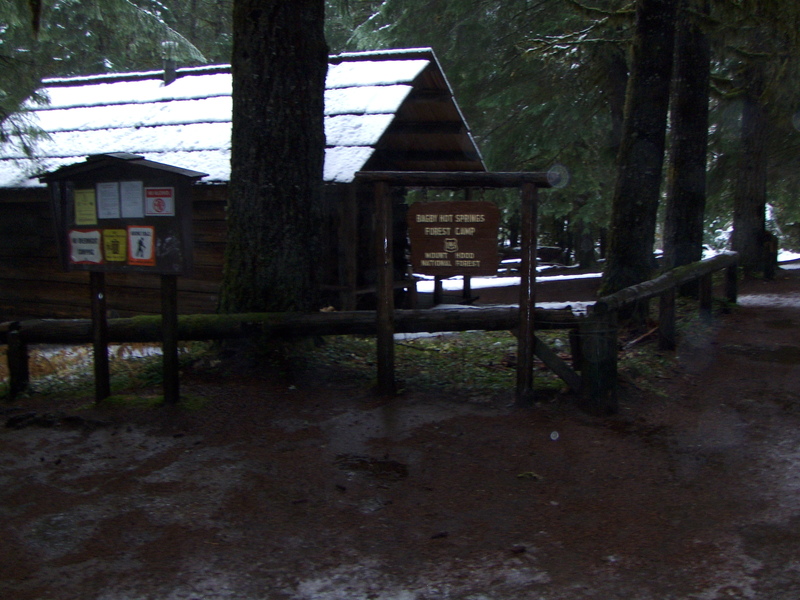 We finally arrived at the Ranger Cabin, gateway to the Bagby Hot Springs infrastructure. I think they said that this is occupied during the summer season. As an added bonus, we were at the edge of a Wilderness area. The idea of “wilderness” has always appealed to me. Nice to know they’re there. Most the “tubs” are canoes — idyllic for a romantic interlude for two, and once obtained, probably difficult to share with anyone else. And the crown jewell of the facilities is the Big Hot Tub. it is a rare day, or night, or whenever, when you can just hike in and THE BIG TUB is yours ! As we had grown to suspect, the entire place was OURS. The picture, above, shows the ladies opening up their sandwiches. The “white thing” is the end of the pipe from THE SOURCE of the hot water, and if you don’t want to scald, another pipe from the cold stream is available. You can moderate between these, adjusting the water temp. I think when we arrived, the hot pipe only was flowing into the tub, so we had to turn that off and turn on the cold. Sometimes I become like the Christopher Lloyd character from “Dream Team” and pick up trash. I was dismayed to see empty bottles nearby and other discards. Once suitably warmed, I would venture out of the embryonic amniotic vessel and gather and stuff as many as I could into the nearest trash-can. I presume that this being a treasured spot in Enlightened Oregon, the continuing beautification process was in a brief lapse among whatever collective consciousness should ordinarily prevail. sometimes it was foggier ! Yes, as the storm continued, and the slushy snow gradually changed to not-so-slushy snow, we had periods of fogginess. Which, of course, added to the mystical aspect. We were about as far from the dry high desert of Western Colorado as we could get. And quite pruney. Night was imminent, and so we put the soggy tub-garments and other soaked items into a plastic bag, and prepared for departure. Fortunately, I had brought a large down winter coat purchased at a Columbia outlet store when in Portand on a previous visit. 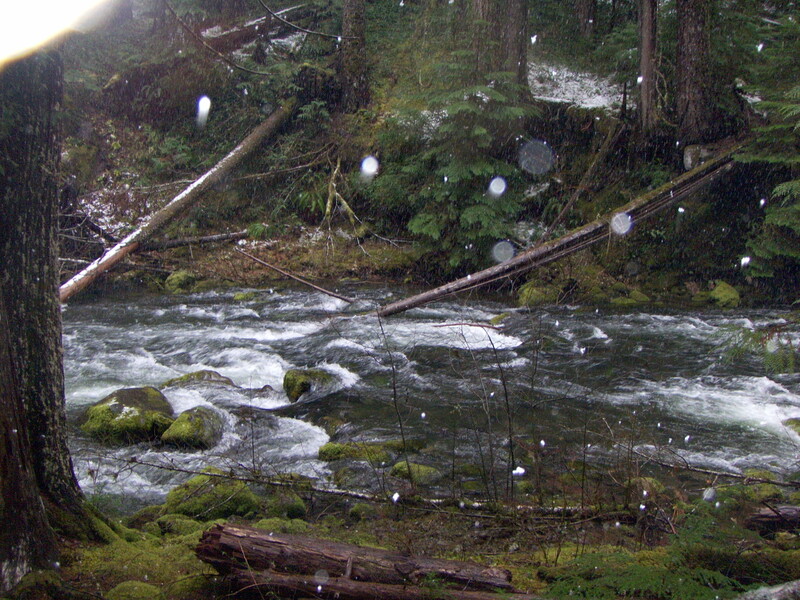 I suppose that forests nearer the coast in Oregon should, on occasion, resemble those of Colorado in winter — snow-covered. But the grass and small plants and, well, everything, appeared not quite ready for hibernation. In spite of the “attack of the white stuff” it seemed there was a force field of resistance. The so-called ‘annual’ (as opposed to perennial) forms of life seemed impervious to this onslaught. The trip down went a bit faster than that coming in. And — we encountered the two guys we had seen a couple hours back, many miles down the road — riding their bicycles on the trail. In the gathering dark, it’s a safe bet to assume that they were going to spend the night. We continued hurrying to the car. Surprizingly, none of us was freezing. Not very uncomfortable at all. I was as, well, relaxed as could be, under the circumstances. Dog (Aspen) was glad to see us. And for the passengers, there was still some of that sedative hydrational substance for the drive back.